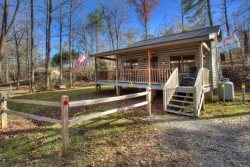 Elegant and rustic, Outback Lodge is a vacation cabin rental that offers affordable luxury, incredible mountain views with access to 50 acres adjacent to the Chattahoochee National Forest with hiking/biking trails! Outback Lodge is the perfect combination of upscale comfort with a natural mountain flair in a beautiful secluded and private setting. The woods around this vacation cabin rental are a sanctuary for deer, birds, and wildlife that make this acreage their home. Its not unusual to see wild turkeys stroll down to the pond for a drink, or hawks catch the wind and soar above the cabin! The atmosphere of being part of nature abounds at Outback Lodge. Start your day taking in the gorgeous mountain views from the main level or upper deck, or enjoy a leisurely walk or run through the several trails surrounding Outback Lodge. If fishing is more your style, head to the pond and throw in your rod! No matter how you start your day, it’s going to be a great one at Outback Lodge! No matter how you choose to spend your day, there's only one place to head in the evening! Gather up some firewood and build a crackling campfire in the gorgeous outdoor fire pit! Whether it's toasting marshmallows or being mesmerized by the glowing flames, it's hard to match gathering around a campfire and enjoying time with family and loved ones! Although you may not want to leave Outback Lodge cabin rental, it is conveniently located to Sautee and the village of Alpine Helen GA! • Gravel road and driveway, moderate incline is paved, accommodates 3-4 vehicles. 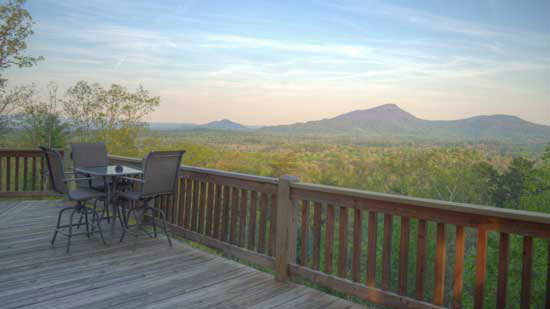 Outback Lodge is approx 7 miles from Helen! I had my questions answered by email very quickly. Our family enjoyed staying on this beautiful cabin away from it all. We enjoyed the beautiful view and the peace. We would love to come back in the future. We loved our stay, it was super relaxing and hassle free. We will definitely be visiting and staying in a cabin again. Cant say enough we loved it. The staff was excellent, they were friendly and helpful. The stay at this cabin was the best experience anyone could ask for. I will for sure be back. Loved the family time and oh what a perfect place. I never had issues during booking or our stay so the only communication I had was on line and it was very friendly and accommodating. Outback Lodge is the perfect place to relax and enjoy peace and quiet. You have the feeling you are in the middle of nowhere, but you are close to wineries, downtown Helen, restaurants and shopping. It is the perfect secluded location. Professional and so nice and helpful! Had an amazing and relaxing weekend. Perfect cabin for a secluded, romantic weekend. Beautiful, peaceful, and close to adventure of you want that. The perfect vacation. I had minimal interaction, but when I asked a question by email, response was quick... thanks. Great location with easy access to several north Georgia destination attractions, towns, and parks. Great mountain sunset views from the patio. We had a very enjoyable visit to the cabin. Both families commented several times about how nicely decorated the cabin was and how relaxing the trip was. We will certainly consider staying there again. All was good.It was my 2nd time using Pinnacle. This is the reason I will be coming back next year...Stress free and the staff was always so kind. Next year I want to try Cherokee Rose just to change the scenery. Outback Lodge is gorgeous. The view, the comforts of home made the stay so relaxing to the point we hated to leave. Pinnacle Cabin staff made the rental process stress free and simple. This property was in 30 minutes of everything we wanted to see also. Brasstown Bald, Helen, and our new favorite Consolidated gold mine. We will definitely be using them again..Already picking out our next cabin to try out. Team members were great. We had frequent emails and phone calls with Jill and Ashley and they were always very polite and helpful providing information and resource within the area for us to do. Outback Lodge is BEAUTIFUL! The cabin, the property and all the amenities. We were very pleased on how clean the property was. The cabin had everything we needed and was very well built and set up. This house was breathtaking. The decor was beautiful and classy. The beds were comfortable. The hot tub, fire pit and grill made it easy to settle in and have a fun time. We will go back again! Lovely home and relaxing vacation! We loved it, and having a washer and dryer is great for a family. The kitchen is super and it's so spacious on the first level. I hope we can come back sometime, maybe in the Fall. I would like to bring my family next time.